It wasn’t until 1842, six years after his return to England, that Darwin finally began to sketch out the rudiments of his new theory. However, even this wasn’t enough to get Darwin to finish his most famous work. It would take a letter from Alfred Wallace, another English naturalist, to force Darwin to collect his thoughts. The letter, which arrived 16 years after Darwin’s initial drafts, contained Wallace’s own independently discovered theory of evolution. Darwin saw the writing on the wall and knew he had to act fast. Over the course of the next year Darwin worked furiously to finalize his ideas. He published On the Origin of Species in November 1859, over 23 years after returning from his worldwide voyage. We look back upon history as a series of events that seem simple and logically connected. Darwin traveled the world, studied animal behavior, and then immediately came up with the theory of evolution. But that’s not how things unfolded. History isn’t so simple. It actually took over two decades of pondering and working on other matters before Darwin finalized the ideas that would revolutionize biology. Nothing happened, then everything happened. Nothing happens, then everything happens. For example, in March 2009, the S&P 500 hit a low. This low was first reached (on a total inflation-adjusted basis) in October 1996. This means that from October 1996 to March 2009, the S&P 500 would have ~0% real total return. This explains why the red line above goes back from the low in March 2009 to October 1996. These watermarks might seem slightly confusing now, but bear with me. 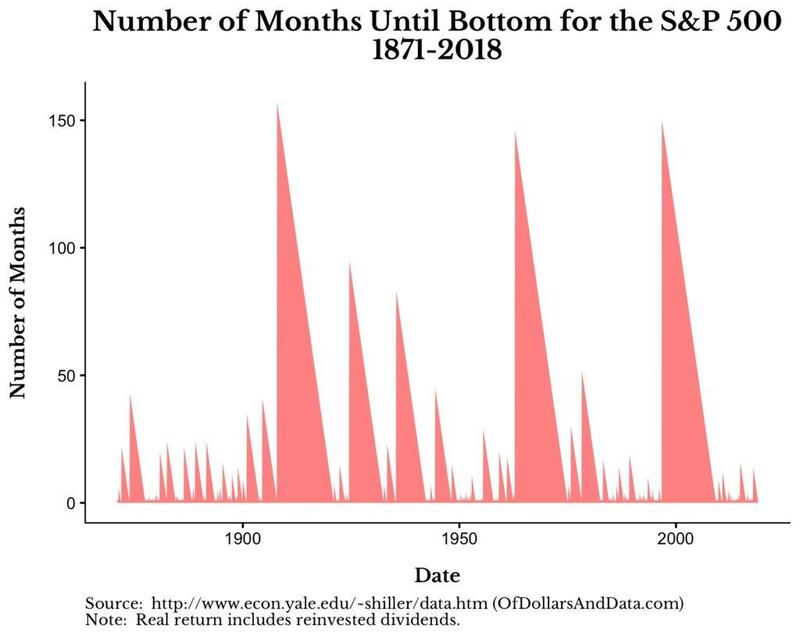 I love this chart because it illustrates how the U.S. stock market has been characterized by fits and starts throughout its history. For example, while decades like the 1950s, 1980s, and 1990s were mostly filled with growth (i.e. 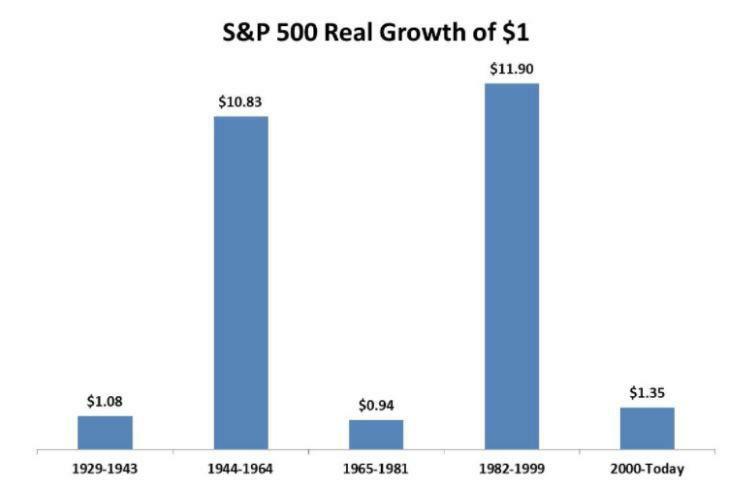 bull markets), the 1970s and 2000s contained large price fluctuations (i.e. bear markets). 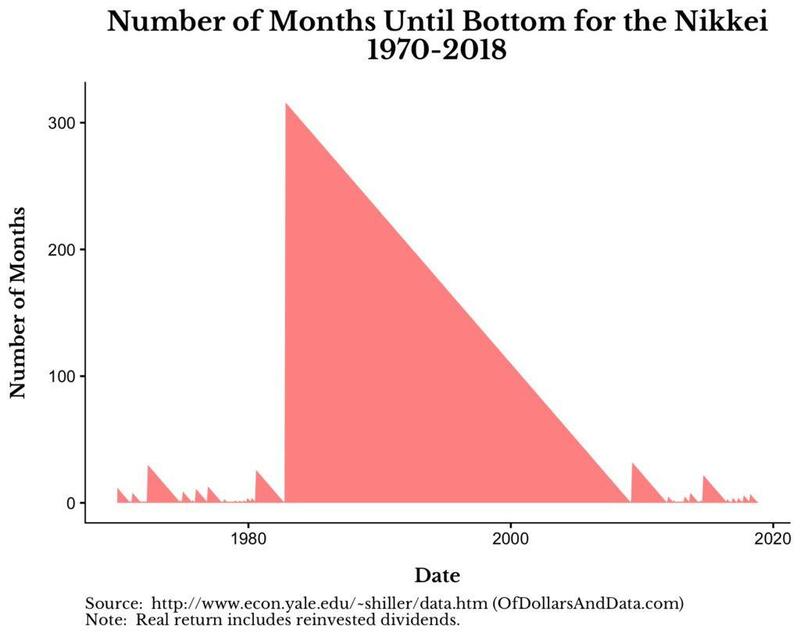 This chart is so good because it communicates a deep insight about markets in such a simple way. 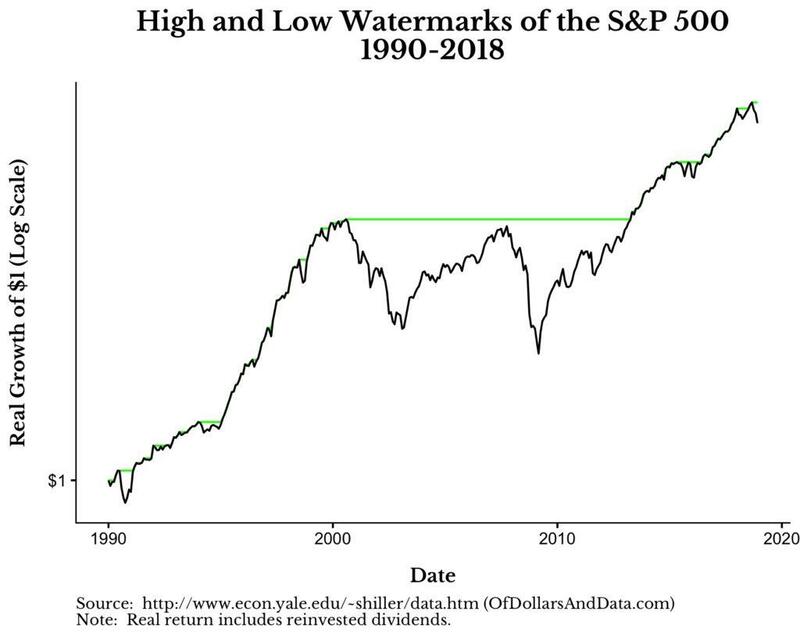 My point wasn’t to bury you in charts, but to illustrate that while market growth is usually lumpy, not all markets will follow this tendency. The first time I learned about how equity markets regularly shift between calm and chaos, I was in awe. What caused such a result? Was it the psychological cycle between fear and greed? Was it something else entirely? I still don’t know for sure. We all go through hardships. We all go through stress. But, we also experience periods of relative calm. It’s the shift between these states that makes life worthwhile. What would life be without struggle and overcoming obstacles? It’s in overcoming these obstacles where we receive our greatest returns. They say that it takes 10 years to become an overnight success. Don’t forget this as you approach each and every day. First nothing happens, then everything happens. Thank you for reading! You can follow Of Dollars And Data via Twitter or through my weekly newsletter (go the bottom of my About page to signup).